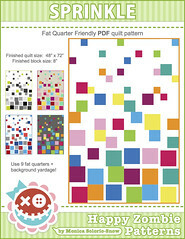 American Patchwork & Quilting October 2011 issue, and it features me. Yes, me! OHH. MMM. GEE… me! Profiled!! I still think they came to my house accidentally, and there’s another Monica out there still waiting for the Better Homes & Gardens crew to show up. PLEASE, rush out a buy this issue before it’s discoved they have the wrong Monica and the issue is recalled!! Oh, and I have a project in it too - Bubble Runner! I’ll let sweet Sarah show it to you - because I’m off to hunt for some towels and a mop. I was so excited to see you in the magazine. I love the project too. I can’t even imagine how it must feel to open a magazine and see yourself looking back at you. Spooky! I think I’d need a mop too. Congrats! Congratulations Monica! I’m SO HAPPY for you!!! 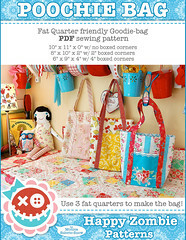 I’m very, very sure American Patchwork & Quilting had the RIGHT Monica! Who else is so quilty, crafty and inspirational!?!? I was getting a bit worried since you hadn’t posted since Yam Camp. So glad the silence has ended in such a sweet way! woohoo! Congratulations old bean! The bubble runner looks fab and I can’t wait to get my hands on the issue to have a good read! Congrats! Such a cute project. I don’t mind sharing you with the world at all! How absolutely stupendous for you! Seeing what you do, your sweet skills… the only surprise is that your work isn’t in more magazines. In time. It is inevitable! Don’t sell yourself short!! You are a fabulous designer and you make things quick and easy. Thanks. The article is terrific. I meant to write to you when I got my issue in the mail but then things happened-ya know! Congrats! I have the magazine but haven’t cracked it yet - now I will SOON! I got mine in the mail the other day and was so excited to see you! Congratulations I saw the runner and I am looking forward to making it maybe with some Halloween then a Christmas one. Oooooh, this is so exciting. I can’t wait to read it. I wish I’d known a few hours ago when I was near the newsstand that sells every magazine known to man. That’s awesome! I can’t wait to rush out and buy a copy. Congratulations! Oh man I know someone who is famous! When somebody asks me about my brush with greatness I’m gonna tell them I know you. Congrats on being the right Monica! I have the magazine and I loved the article about you and the project is cute and happy fabric. Congrats you deserve it. Maybe you can design some Happy Zombie Depends for occasions like this :) Seriously you looked adorable in the article and I am so proud and happy for you! Now get to the mop. Don’t wanna break a hip. It’s just too cute! The artice is great! You soooo deserve it!! I love your sewing studio!! They got the right Monica!! Congratulate!! Go celebrate! I’ll be searching the magazine rack at work for this issue! Congratulations, Monica! They so did not get it wrong. :) Love the bubble runner- it’s so cute! But, I would not expect anything less. no way was this a mistake - you’re the only HAPPY ZOMBIE MONICA :) - can’t wait to get this issue but of course it’ll be close to christmas in australia before we see it - I’m sure it will be worth the wait - hope that pee doesn’t stain !! Eek! I need to go get that now! There is no other Monica….in fact you are like Cher, Madonna, and Beyonce. When people hear “Monica” they know it can only mean you! Congratulations my wonderful friend!! It’s about time! You’re a rock star! And I so love your Happy Mochi Yum Yum fabric. I can’t wait to get a copy of the mag! I know what magazine I’m going to be hunting down this week! CONGRATS!!!! I am so excited for you! There is no “other” Monica!!! Only you! I have that issue, but am saving it for when I have the time to savor it all. I peeked at Sarah’s picture of it, and I want it! Too yummy for words. I’m starting to get a little worried about you, Monica. You seem to be having lots of episodes of peeing on yourself. Maybe you should take Whoopie’s advice and load up on Poise. That was a really fun article and interview! 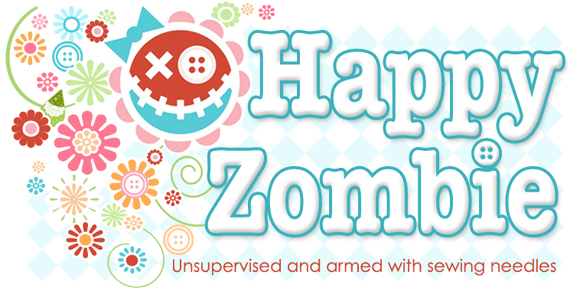 It was a very Happy Zombie surprise to read all about you and your tiny little studio, which of course we see lots of on your blog! You simply must learn to clench at both ends, I tellya! Oh my gosh how exciting, congratulations!!!!!! I can’t wait for my copy to arrive- it always takes longer to get to Norway for some reason…. lol. I can’t wait to read the article :-) So happy for you! Congrates Monica - I have already read the article, its great and its great to “meet” the person who represents The Happy Zombie. Eeeeeek!!! I haven’t seen it yet — CONGRATULATIONS!!! You Da Bomb! I can’t wait to get my hands on it. And that bubble runner is just too cute. You KNOW that bubble runner is going to appear in Happy Mochi Yum Yum, right??? Hah! I just bought that magazine BECAUSE you were in it! This is my first time to your blog.Just finished looking thru APQ and HAD to look you up. So glad I did! Your website is sooo bright and cheery! You are an amazingly talented woman!! 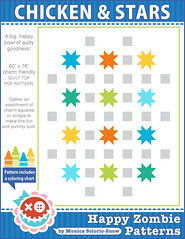 I can’t wait to make the Bubble Runner quilt for my grands. Aha, I’ve seen the lovely bubble runner at Sarahs’ already, but I can’t wait to find the mag on news stands here to read all about you. You need to get yourself some Depends for next time, girl (they may come in handy for next Yam camp, too, thinking of all the cackling you girls do!!). Woohoo - new mag for the beach, coming right up!!! 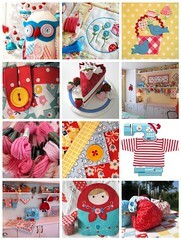 congrats I love seeing your sewing studio and all the neat things you have! 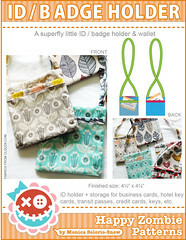 I have always enjoyed the posts on your blog over the years of your sewing space as well. Adorable project in the magazine, aren’t they just the best to work with? Big old Congrats to you. But seriously clean up the wee wee. I don’t think they would take kindly to that. lolol Loved seeing and reading you!!!! Monica!! My HERO!! I sent you a tweet the day I got my magazine. (not sure you saw it) We get them right from the bindery (due to the company I work for - which this magazine is a client of ours) and I was sitting at my desk when I flipped through it and saw you! I jumped up and started doing the happy dance!! I was/am THRILLED for you!! Bought it, read it, loved it. I was very excited when I saw the bubble runner and am on a hunt of my own to find some Yum Yum to make me one. I have that magazine and was so excited when I read your article. I might have said out loud, “Hey, I KNOW her! !” I mean, we HAVE emailed back and forth a couple of times so we DO know each other, right?? Anyway, super great article. Gorgeous pics! I was so surprised & happy for you when I got my AP&Q in the mail last week. This is just your time! So glad to see your success. How very fun, I did get my copy the other day and once again I drooled over your space and your fabric and that pattern…hurrah! Was so totally happy when I saw you in the mag - you are awesome! That is so awesome. I can’t wait to get hold of a copy all the way down here in Australia. 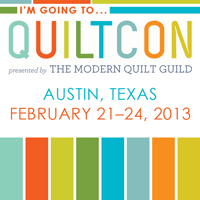 Does that make you an “international quilting megastar”. Saw it, bought it, loved it! You should not be surprised, you deserve it! Congrats! I tried to find a copy to buy at JoAnns yesterday to no avail. 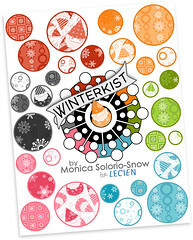 I will look again or see if my local quilt store has a copy! I got my magazine on Monday and was thrilled to see your article. I had it read before we got home from the store. Hubby was driving. Your inspiration room was wonderful. And it is so great to see designers show off other designers (Bunny Hill). So generous. I had a almost pee’d moment myself. Since you had emailed me previously, I was a bit famous too in a “six degrees of separation ” kind of way. Congratulations! And nice new fabric. So very cool! And well deserved too. Do you remember being at my friendship group last night and me bragging about you???!!! Oh wait, that was you in the magazine with me at friendship group. So proud and happy for you!!! I’m sure there is no mistake! Congratulations! CONGRATULATIONS!!! How cool is THAT? I will run out and pick it up on my way to the BEACH! CANNON BEACH! Your neck of the woods…I’ll be down there for one glorious week…lookin’ at the early morning tidepools. Gotta love it! What a fun article and shows off your fabulous space! isn’t it amazing when they visit? Oh Monica! Never doubt yourself. 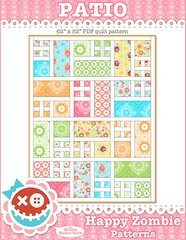 You are a fabulous pattern and fabric designer and you deserve to be in American Patchwork and Quilting. You can bet as soon as I see it on the newsstand, I’ll be buying a copy. I sat down to read my copy of “American Patchwork Quilting”. It was so much fun to see the article on you. I love your studio. It makes me inspired to improve mine. I also thought your bubble runner was adorable, I will certainly have to make that. I was thinking that it would be fun in Christmas fabrics as well. I know you have so many comments that you do not need another, but I was very excited to see you in the American Patchwork Quilting Magazine. I saw your bunny hill quilt in the photos and I am hand quilting mine now. 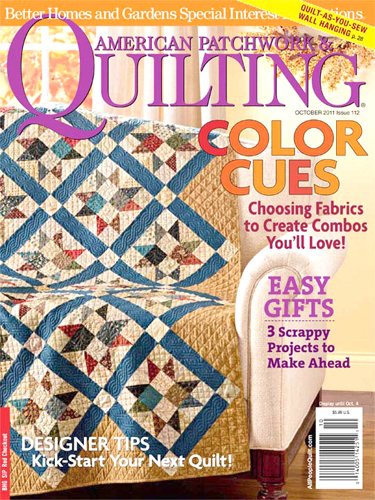 So… congrats on the spread and keep quilting! Monica, you are by far the coolest coolio, I know! Congrats on the much deserved feature. I’ll be running out to get that, stat! I read the article and loved the pictures. You have inspired me! Now I know you’re out there I’m following you. It was so nice to get to know you through the article. (I don’t usually buy quilt mags, and my library only carries one, but this was the one!!) 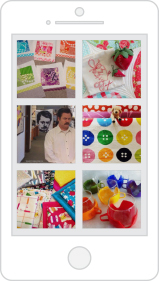 Lovely studio, lovely project, lovely quilter! Your awesome! Can’t wait to tell the neighbour that my mum is famous! I love you happy zombie! Bet it’s awesome. I love the bits of your home you have shown on your blog…so full of personality. Congrats on the feature! I saw your mug shot in the magazine when I picked it up from the mail! I can’t wait to really have time to sit and look at it. My dh is going to be gone for the whole month of Sept. I will have plenty of time then. Okay, so I know I’m a little out of the gate on this one, BUT I just saw the article yesterday. Loved it, found your blog, read a bunch and realized the we must have just missed each other at several of the QfQ sewing bees around PDX. Anyway, hearty kudos on the profile! Great article, awesome pics. 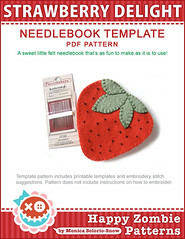 Hi I love the apples in the magazine and have looked on your blog for a pattern. I saw that you did not have one but that was a couple years ago. I would love a pattern they would make great teacher gifts. I just subscribed to Ametican Patchwork Quilting. My first issue arrived and I have already read it cover to cover. I loved that article about you and I would live to have a room like that to sew in. Thank you for all you do to inspire. Love your blog!